Many virtual bloggers are using holiday tunes as themes to coincide with their posts and while sometimes I do that (and likely will before it’s all said and done) I decided to take a trip in the music time machine about 12 years to a time when I was able to listen to an internet radio show by one of my friends out East on his College campus. Those were good times and I walked away with a lot of good tunes and diverse music from the time; one of the bands that I recall hearing on the show was Saosin. The song just seemed one of those that was meant to help uplift and inspire people who might be down and at that time I really didn’t feel like I do some days now but it helped remind me now why I liked the song. I liked it so much that I did a lot of searching to find the CD it was from (it was a bit hard to find but luckily I managed to locate it at a resale shop which are just about extinct today). “You’re Not Alone” taught me that you could be having a really crappy day, week, or maybe even possibly year but there’s going to be someone (and that someone may be from a place you’d least expect) that cares and will help you see the brighter side and knowing that waking up the next day is completely worth it. Years have gone by and since lost contact with my friend but there is something invaluable about a friendship bonded by music and it may be that we ended up on different paths and made other valuable friends I for one am glad to have made his acquaintance and who knows maybe we’ll come across one another in cyberspace once again. 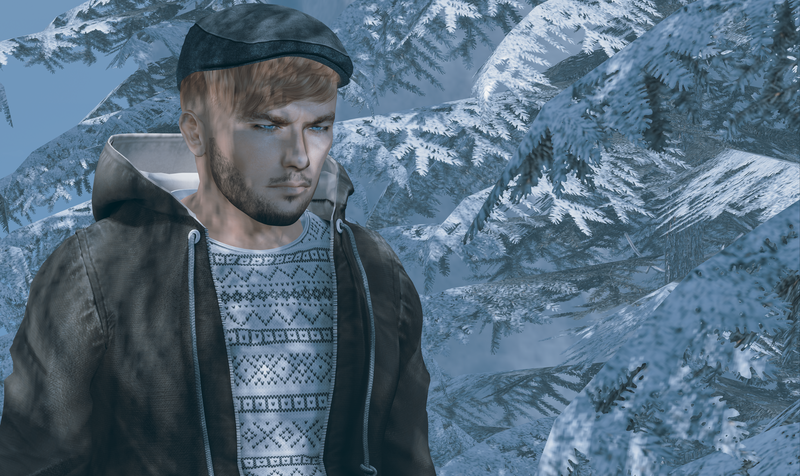 There is still time to shop the December round of FaMESHed and one of the good finds there is the “Simon Hat & Hair” by Modulus. The flat cap is a classic form of headwear that has been a part of fashion for many years (for longer then I’ve been around). Modulus has produced a well made and well textured cap along with some stray locks of hair flowing from the front which definitely caught my attention. Modulus is certainly the hair store to go to for anyone that likes hair combined with hats of different types, as there have been a newsboy cap, some beanie releases as well as snapback caps in both front and backwards styles. These combined with regular releases that vary in length from short to long as well as newer styles with mirrored versions make Modulus one of THE places to get cutting edge hair styles now and for years to come. One thing that is for certain is with this being the time of year where clothing makers on the grid release jackets and coats the outside winter photo is a given. I am pretty sure that this year I’ve taken more than I have over the course of my blogging career but with many sims being seasonal it makes finding a different location to take pics at easy to do. Native Urban now has in their store the “Hexagon Jacket” that I relate more to being a parka with how it is styled but I think how these things are classified is well above my level of awareness. I just know that this style is very comfortable in the real world and able to keep those pixels warm just as well. With the all colors pack at my disposal I was able to play around with the style until I decided on what you see in the above full scene portrait. I am quite fond of the special winter sweater textures that come with the complete set of colors; it makes me feel a bit more festive which is probably something that might surprise those who know me well. Hermanni Laville is back with a vengeance after not only collaborating with Tonk Tomcat of TonkTastic but also releasing the “Eyes of the Beholder” last month at TMD (which he’s since updated with even more colors in the line). Now he’s getting back to doing one of the things besides clothing that I fondly remember him for before a bit of a break going off the grid. The “Mario Facial Hair” is a CATWA branded set that has three different styles and comes with both a dark applier as well as a tintable one for those of us that desire to have facial hair that is more than just standard black. For the male aesthetic I definitely give this high marks considering I fancy myself is a connoisseur of virtual beards. I’m not exactly sure what is in store for the Hermony brand but if these latest releases are any indication I look forward to what’s to come in 2019! Lastly I want to encourage any and all to visit “Luane’s Magical World” which hosts the winter wonderland that I was parked at to take the photos for this blog post. It’s pretty nice to just walk around at and it’s honestly quite peaceful and for someone who very rarely gets around other than to shoot photos I definitely think others should see the joys of what I witness. I likely have at least one more blog post in me before Christmas Eve or Christmas Day but when that’ll be posted is anyone’s guess but I’m going to try and get it worked on as soon as I possibly can because the idea I have requires me to do some scene building of my own and I am self admittedly a terrible decorator and or scene creator. Yes, I know it’s a little late as Christmas has passed but I was in the process of working on this and my last post around the same time but that one just seemed to get finished first. I think it’s still viable to show a scenario of what happens around this time of year. Celebrating with someone close to you and just appreciating the good things that come. 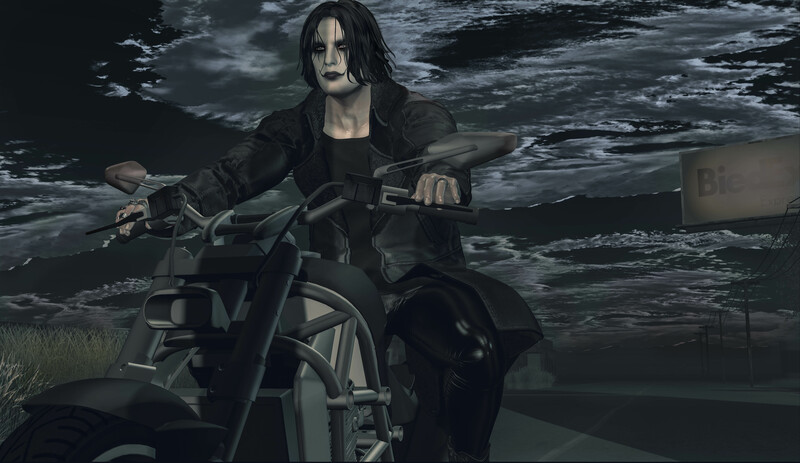 In my last look I was wearing the Jimmy skin by Clef de Peau for the ADAM mesh head with Bento. In this photo, I’m wearing the one designed for the Damon mesh head with Bento by [GA.EG] with some slight tweaks with the face sliders. You can definitely tell there is a difference between the two products so there’s some parity there. For the second shoot in a row I’m wearing something from the FaMESHed event. This time it’s the Pajama Onesie in White by NOCHE. The package comes with fits for [SIGNATURE] Gianni and TMP mesh body. I should be back for at least one more look for 2016 but just in case I don’t, I hope everyone has a safe and enjoyable New Year’s Eve and let’s all strive to make 2017 better and be better ourselves in any way we possibly can. Until next time, stay stylish fellas!